Fun, Fun, Fun! Is adventure calling your name? Are you a thrill seeker looking for an experience of a lifetime? 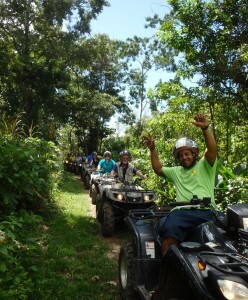 This Jungle ATV Adventure is the ultimate way to explore the jungles of Honduras. Begin with an approximate 30-minute ride down the rural roads of Honduras, to Campo del Mar where you’ll begin your off-road adventure into a tropical jungle. 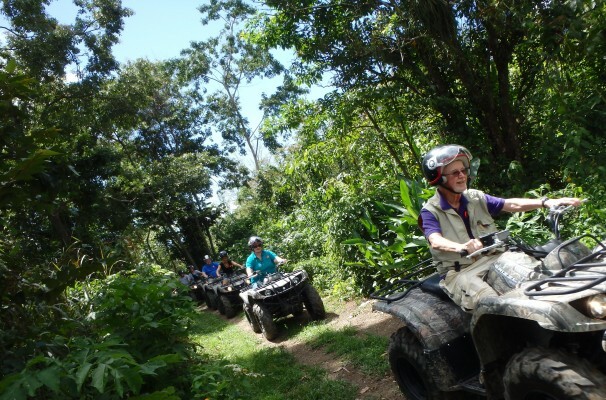 You’ll ride your very own ATV 4-wheeler through the winding, narrow jungle paths of tropical vegetation and experience a variety of eco systems. Take in the sights and sounds of the jungle as your guide takes you through rivers, swamplands, and thick jungle where little sunlight penetrates. Learn Honduran history and folklore along the way with various stops throughout the tour. It’s exciting, thrilling, and invigorating. So are you game? Trail may be muddy and you will get dirty. The Tour Operator reserves the right to deny any tour participant, prior to the tour departure, he/she deems not capable of driving ATV. December 2014: While on the cruise ship Ryndam (Holland America Line) we stopped at the port of Trujillo, Honduras. My wife & I and our two teens (18 + 17) had booked onboard for the ATV ride through the jungle at the Campo del Mar Nature Park (participants had to be 16 or older and have a valid driving license) at a cost of around US$80 per person. Along with another 8 cruisers we boarded an old US school bus for the short 15 minute ride along the beach road to the nature park. Once arrived we were quickly provided with safety helmets and were asked to choose any of the parked ATV’s to ride. The majority of the ATV’s were Yamaha Grizzly 350’s which looked almost new. After a short introduction on how to operate the ATV’s and safety signs for those of us who had not ridden one before we were off on our individual ATV’s following the guide on the narrow trails cut through the jungle. The ride was FANTASTIC! We went up and down steep hill sides, through rivers, across wooden makeshift bridges, challenging terrain and through spectacular scenery at speeds ensuring that we enjoyed the most thrilling experience imaginable. We had a couple of short stops to be briefed by the guides on specific points of interest along the way. The ride lasted over an hour and, by far, was one of the most enjoyable excursions we have ever taken on a cruise! This was the best one ever! True jungle, mountains, river crossings, mud in rainy season, and hairpin turns. Everyone was pleasant and attentive. One water break was by a beach where we saw a beautiful green snake. In all my crushes, never witnessed a more welcoming port! Excursion staff was VERY appreciative of us. They truly seem interested in building cruise business. ATV run was great. Easy to navigate but with enough challenges to make it fun. Saw great jungle and beach views. In all my crushes, never witnessed a more welcoming port! Excursion staff were VERY appreciative of us. They truly seem interested in building cruise business. ATV run was great. Easy to navigate but with enough challenges to make it fun. Saw great jungle and beach views.